The train thunders along the track, through rain, fog, and smoke. In my seat by the window, I fidget with the camera and leather satchel on my lap. Beside me, Hugh pages through a newspaper he's already read twice since we left Victoria Station at ten this morning. He checks his pocket watch; it's twelve fifteen now. "Bruises on her neck," says the older plainclothes officer. He's stout with a grey beard. He points at the purplish marks on the woman's white skin. "She was strangled. Probably after he killed the man." 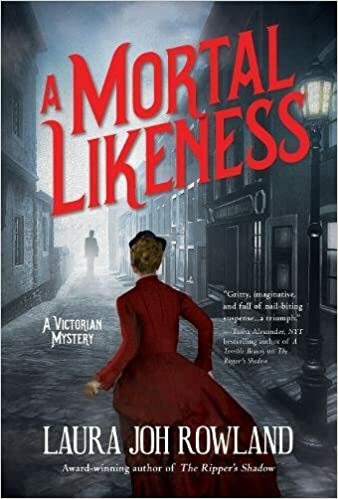 A photographer in 1889 London, Miss Sarah Bain runs a private detective agency with her friends, Lord Hugh Staunton and former street urchin Mick O’Reilly. Their sole credential is that they solved the Jack the Ripper case, a secret they can never tell because they did it outside the boundaries of the law. Their new big case arises when a wealthy banker, Sir Gerald Mariner, posts a handsome reward for finding his missing infant. All of London joins in the search. But Sarah has an advantage―a photograph she took during a routine surveillance job, which unexpectedly reveals a clue about the kidnapping. After Sir Gerald hires Sarah, Hugh, and Mick to find his son, they move into his opulent mansion and discover a photograph of baby Robin. It eerily resembles postmortem photographs taken of deceased children posed to look as if they’re alive. Was the kidnapping real, or a cover-up for a murder? Is the perpetrator a stranger, or someone inside the troubled Mariner family? The case hits close to home for Sarah as it intertwines with her search for her father, who disappeared after he became the prime suspect in a murder twenty-three years ago. She finds herself on the wrong side of the law, which threatens her budding romance with Police Constable Barrett. But Sarah must uncover the truth about Robin’s kidnapping, and her own family, before her past catches up to her in A Mortal Likeness, the gripping follow-up to award-winning author Laura Joh Rowland’s The Ripper’s Shadow. Sounds really good! I love books in which the characters ride on a train. The train offers such an atmospheric opening. Thanks for sharing, and for visiting my blog. I love the cover and it sounds great! And the author writes so visually. Happy reading, Kathy. I like the intro and teaser. Going to have to check this one out. I liked the writing in the intro. Good teaser too. Wondering who is dead and why. Hope you're enjoying it! Thanks for coming by. She finds herself on the wrong side of the law a lot, I take it. What a great cover! I love trains, I hope you enjoy it. The excerpt has definitely sucked me in! What a wonderful opening - this one sounds great. Many thanks for sharing, Kathy:). The intro sounds interesting. Hope you enjoy it, thanks for sharing!